Since I've been away from my blog for awhile, I figure I owe it to you to at least return with a completed project! 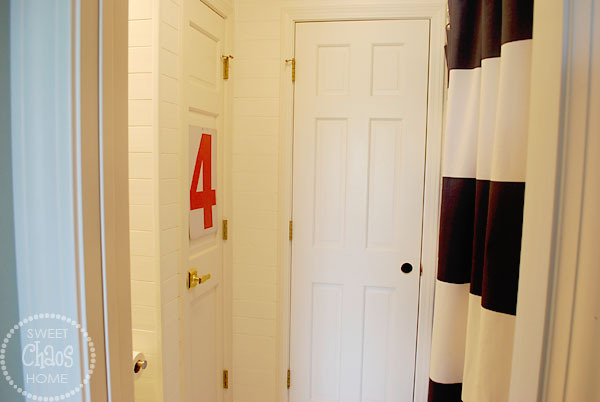 The walls in the kids bathroom were planked, primed and painted. The room is tiny, so I thought it would be a relatively quick process. Silly me. The planks had a lot of holes that had to be filled and sanded, and then it took two coats of primer and two coats of paint. And, then there was more caulking to be done. It didn't help that our upstairs A/C unit bit the dust in the middle of the project. It is hot in that little room! Of course, as soon as the walls were dry, I was chomping at the bit to get a couple of accessories hung up. 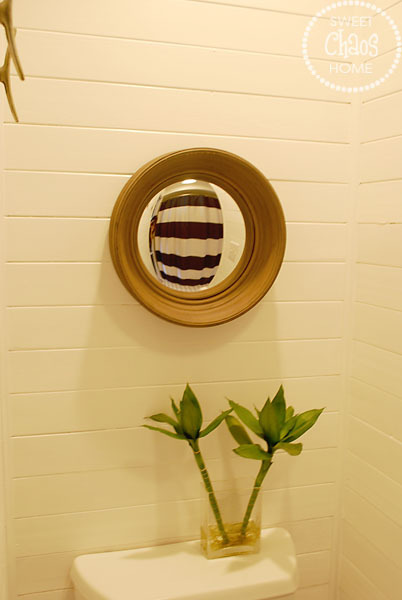 The porthole mirror came from Home Goods. 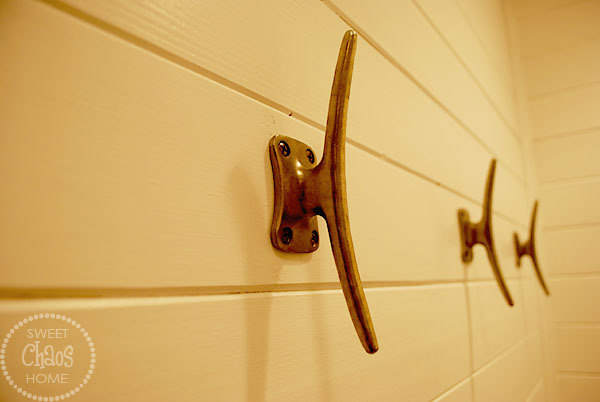 The hooks are from Anthropologie. 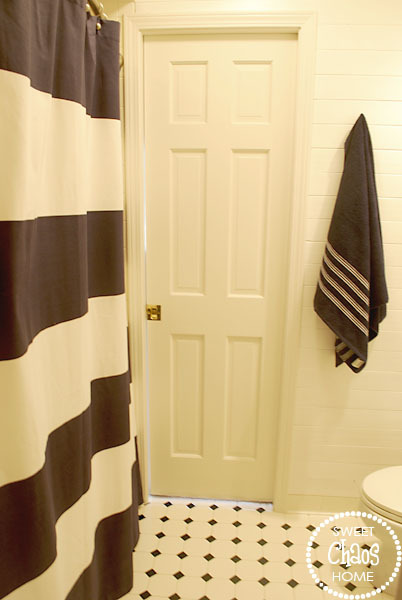 I'm digging a little nautical vibe, without being too cutesy. 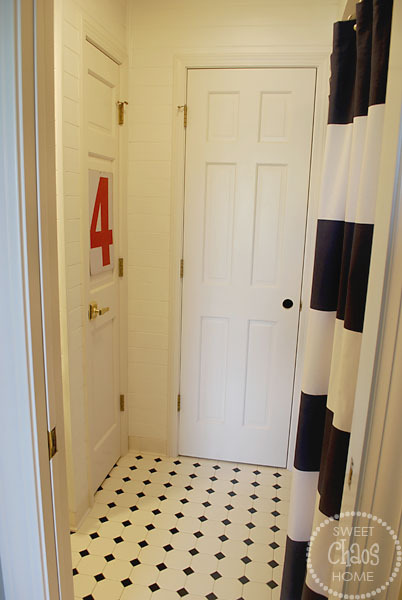 The vintage gas station number offers a pop of red and represents the 4 little men who share this room. This may very well be the last time the toilet seat is in the down position. But, at least the plant might get watered. Sorry. I couldn't resist. Little boys don't always aim to please. I am pleased with the planked walls, though. They add a lot of character to what otherwise could be a pretty bland space. There's still some work to be done. A nasty shower faucet will be replaced tomorrow (hopefully! ), and I am in the process of changing out the door hardware. I've removed one of the door handles. Now I need to get rid of the rest of the worn out brass handles and hinges and put the final touches on this room. You are one stylish gal. 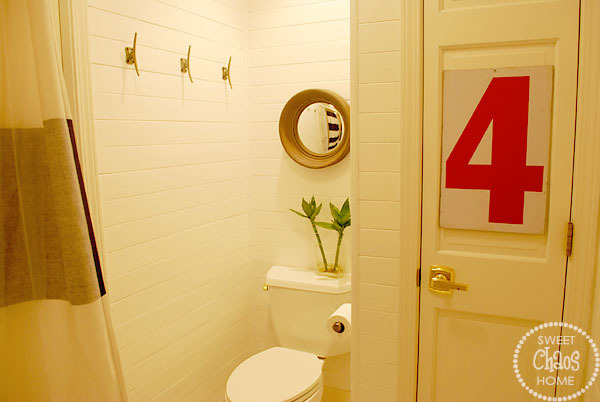 What a great space, Carolyn! I love the new walls. They make such a difference! 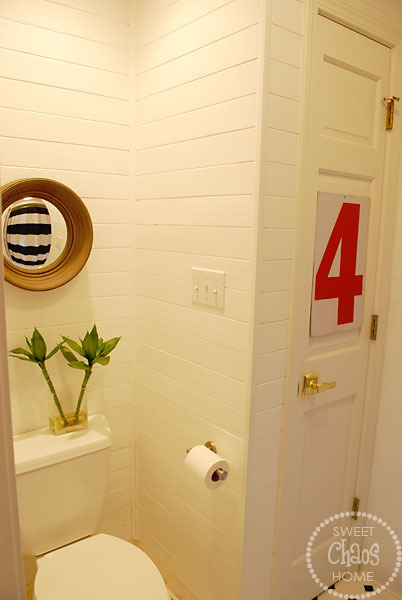 Absolutely love your bathroom! Your walls are beautiful!! 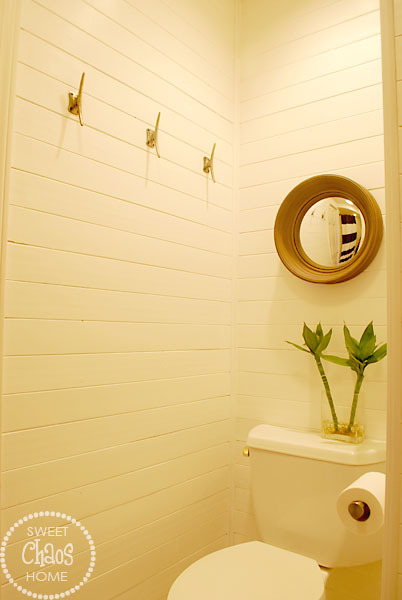 Did you use wood planks or MDF cut into planks? I am thinking of starting a project that involves plank walls and you have motivated me to get on it!